John calls me early this afternoon and asks whether I want to come along while he continues the left engine break-in on the Oakland Flyers Duchess. Well duh! I drop the work I'm supposed to be doing on a website for a friend (one of the Artists  sorry, Scott) and rush to Oakland's (KOAK) Old T's, where John's preflighting Duchess 15Q (above) in the tundra in front of Oakland Aircraft Maintenance (the shop that's helping with the break-in). I've actually flown in Duchesses before, most memorably during my initial PP-ASEL training, with Edd ("short for 'Eddy'") P., a colleague of mine at the time who let me "fly" large parts of a relaxing flight along the coast and Peninsula, San Carlos (KSQL) to Salinas (KSNS) and back again while he maintained currency. I couldn't log that flight, of course, but I did learn the basics of how to keep the Duchess stable, upright, and on course, all at the right altitudes (there's a punchline in there somewhere). ), it'll pay to keep our eyes especially well-peeled (or some such metaphor). 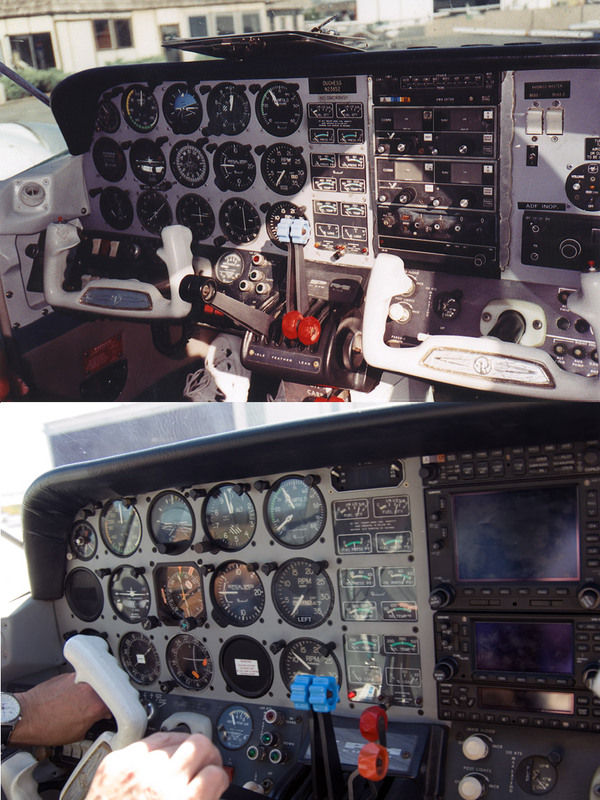 The plane looks and feels well-maintained and looked-after, and from the right seat the cockpit looks familiar, similar to the Duchess I flew all those years ago, except for the nice Garmin 530 / 430 panel on the right. Unlike the first time, this time pretty much everything on the panel and all the controls, etc., are familiar and make sense to me, and I feel well at home.
" 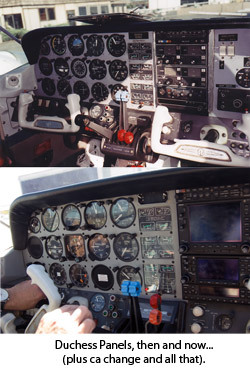 as John says), the Garmins make casual IFR flying a lot more pleasant, the forward view from the cockpit is easily the best I've seen in a low-wing plane, and it basically just felt like a straightforward and safe aircraft. 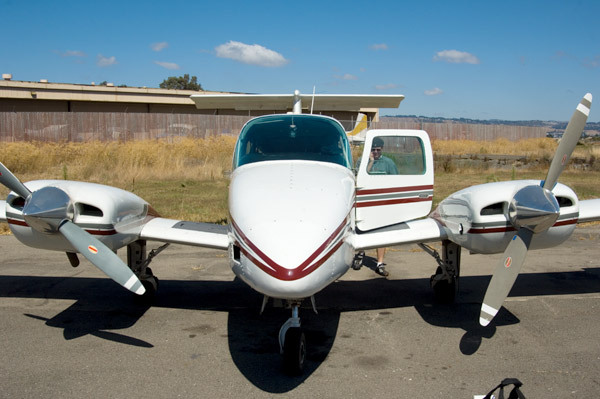 We turn back a little before King City (we don't need to land, just do about two hours' tach time in the air), and shoot the ILS 27R back into Oakland, with John flying (no cone of stupidity for this, as I can't act as safety pilot on a twin). Back on the ground at Oakland we do a magneto test again before refueling, and the results aren't promising  although the engines have been smooth and well-behaved in the air, back on the ground the left engine's running rough during the runup on single mags, and since we can't do the standard lean-it-and-rev-like-hell plug clearing on the new engine, it'll have to go back to Oakland Aircraft Maintenance for plug-pulling or worse. and all this is yet another slippery financial slope I could really do without. We shall see. Back in front of Oakland Aircraft Maintenance, Eric and his crew wander out and look the plane over. Apart from the rough-sounding left, there's a slight oil leak on the right cowl from the prop, and John and Eric agree it should be looked into. Eric's pessimistic about the left engine  he thinks it's probably one of the magnetos rather than the plugs, and he'll work on it on Monday. The good news is that the left engine barely used any oil during the two hours of use, and the actual break-in appears to be relatively successful. With (maybe) a new mag (or just a plug cleaning) and (probably) a new seal for the right prop, the Duchess should be in good condition to return online sometime next week. Earlier, as I'm walking across the ramp at the Old T's, I see Lou Fields's Thunderchicken in front of a hangar, and wander over to see if Lou himself is there as well. 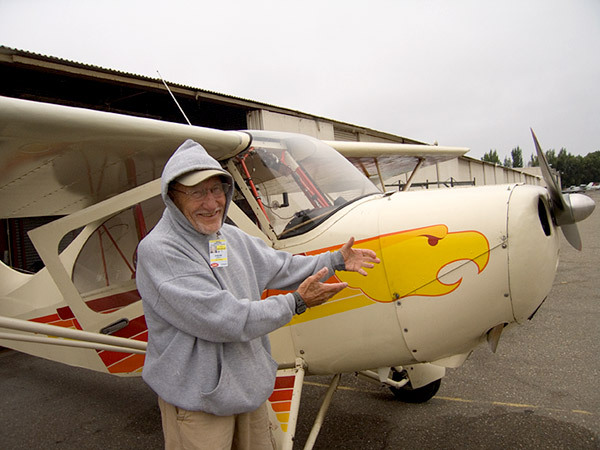 I haven't seen Lou for a while now, but he's still the same  he seems happy to see me; I'm definitely happy to see him, and we talk a while about the Thunderchicken (Lou's jokey name for his '46 Aeronca Champ, above, with Lou in front) and Oakland gossip. The champ's got radio problems, apparently; I say I'm surprised it's got any radios at all, but as it's based in Oakland, I guess it has to. He has a portable GPS in the cockpit  he wouldn't fly the thing without it, as he's said several times, but there's a panel-mounted radio in there too, somewhere. It's always pleasant talking with Lou  as I've written elsewhere, over the years he's watched me get my private license, then let me rent his Arrow to get my complex endorsement (and later just to fly around for fun), he had some usefully-pithy advice when I was having trouble learning to do good wheel landings in the taildragger, he had similar things to say about my aerobatics training (until a few years ago he still taught aerobatics, and he got on well with Ben, my then-aerobatics instructor), and, until some health problems cropped up, he was slated to be my DE for the instrument rating a couple of years ago. He's been a constant background presence in my life at Oakland's Old T's, and I've always been grateful for his help and his sense of humour. Lou flew off carriers in the Pacific during WW2 and for many years after that, including Korea, and is something of an institution around here. Lou is SOMETHING of an institution? What, pray tell, do you have to do be become a ful-fledged Institution? 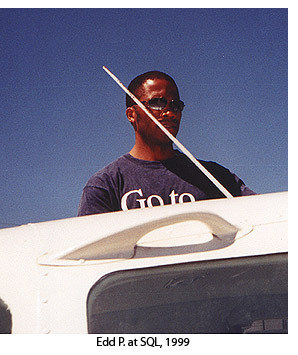 I flew with Lou back in 1991 and he taught me aerobatics. What a great man. A gentleman I will never forget. And what a great instructor!